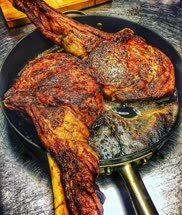 Buffalo tomahawks cooked in frothy butter in a screaming hot oven. The good: This food is low in Saturated Fat and Sodium. It is also a good source of Riboflavin, Vitamin B12, Iron, Phosphorus and Selenium, and a very good source of Protein, Niacin, Vitamin B6 and Zinc.